Making Dam Beer - Craft Beer Made Here! No other Colorado high country brewery can say they offer as many different beers as we do. 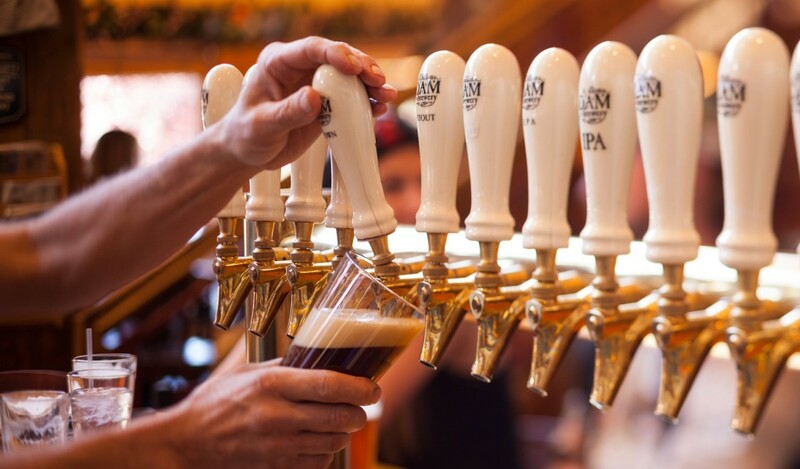 We offer more brews on tap than most bars do, and they’re all crafted right here. It starts with our brewing system. Built by JV Northwest, it is one of the best in the industry for our size. Clean welding and well-built stainless steel vessels prevent contamination of flavors that can be challenging with less refined systems. We have the brewing capacity to offer many different beers to our customers. A large variety of rotating seasonal and experimental brews keeps people coming back to see what’s new. It also gives the brewing team a chance to explore new and exciting recipes and brewing techniques. We have a strong list of classic Dam brews including Sweet George’s Brown, Dam Straight Lager, and Here’s Your Dam IPA as well as a large rotation of new and exciting seasonal beers. Different flavors begin with our brewers shooting for a concept. “Whether it be a brew that will go well with the season, or one our customers begged for, a traditional beer style that we’d like to take a crack at, or a new ingredient that we’ve been dying to use, we’ll have a beer in mind that we are looking to brew.” says Brewmaster Mike Bennett. Next they do some reading, research, and examine style guidelines to help narrow down a plan and piece together a recipe. “This is one of the most enjoyable parts of the job — second only from enjoying our final product,” says Bennett. We believe craft beer is beer in its purest form. Made by hard working folks who put in long hours perfecting their brews. Whether perfecting a traditional style like a Vienna Lager or brewing a Saison with fruits and spices, each brew is an artistic reflection of the brewer and his team. If you want to know the real intricacies of how beer is made, check out our self-guided brewery tour and examine our system when you visit.